apparently haven't been around for almost 3 weeks. I couldn't believe it when I looked at the date of my last post. and was dragging my feet on. I painted the ceramic tile in my entry. I may be little crazy. At least I'm sure my husband thinks so. put an awesome dresser and fancy it up with fun décor. Okay, I'm a little jealous. area and thought paint would be just the thing! After cleaning it very well and using some Krud Kutter I taped it off. case this redhead had a blonde moment or something. Okay, here's where the problem(s) started. Okay, I know that's a biggie. it just didn't belong in this spot. Second, NOT all chalk paint is created equal. I love chalk paint, but it's not all suitable for all uses. The charcoal is CeCe Caldwell. even after applying the "durable top coat." That being said, I've seen in used on lots of furniture with awesome results. Okay? Just not this ceramic tile. I can't possibly get all the paint off and go back to the "before." I sanded off as much of the gray as I could and washed the dust off. contrasting and would go better in this spot. I mixed up some homemade chalk paint and started over. so I sealed the whole thing with a couple coats of poly-acrylic. I'll probably do at least one more. I almost didn't write this post at all. on one corner of one of the tiles. Some of the paint had chipped off. and/or the paint dust wiped off before the next paint went on. and I don't see any other signs that it will continue to happen. Cuz I was totally ready for this to be done. you like it and you have to go back to square one. I am really pleased with the final product. It add a little visual interest and lightens up the corner. primer even though you normally don't have to with chalk paint. simulate the checkerboard before I got out the paint brushes. between the door and the floor? If so, what color? I can't match the walls...possibly the door. Okay...I'll try not to stay away so long next time. As a matter of fact...you'll want to come by in a few days! I'm helping out a bloggy friend with her first giveaway! I am disabling comments on it. If you have a valid question, please feel free to send me an email. Oh Kelly- You are a girl after my own heart. Your entry looks really good. It just adds a bit of pizzazz, I think. I once painted a BIG entry hall that had hideous blackened green "slate" in it. I painted it a neutral color and then randomly did a some of the tiles here and there with slightly darker washes of color. I sealed it with car wax -three coats- and it held up beautifully for the 4 years we lived there-even with 4 kids and a dog. I think it looks great Kelly! It really does brighten it up. Personally I hate those ceramic tiles. We've got the light ones in our bathroom and the dark tan ones in our kitchen. I'm wondering now if I could pull this off in one of those rooms. ha. My husband is going to flip. I love it...I painted my whole foyer with Annie Sloan Chalk Paint in Graphite, two years ago. You're right, the new color looks much better than the black and white! That is a great makeover. The black and white did look a bit stark, glad you found a nicer colour combo. Even though you went through some trial and error with the floor, I think it turned out BEAUTIFUL!! This is such a great idea and I already know exactly what area in my house I am going to try this out on! Thanks for linking up to Thrifty Thursday! Thanks for all the inside info. I am always thinking maybe I'll paint some checkered squares. Now I'll know I better be sure before I do it. Thanks again for all the great advice. That was a brilliant idea. 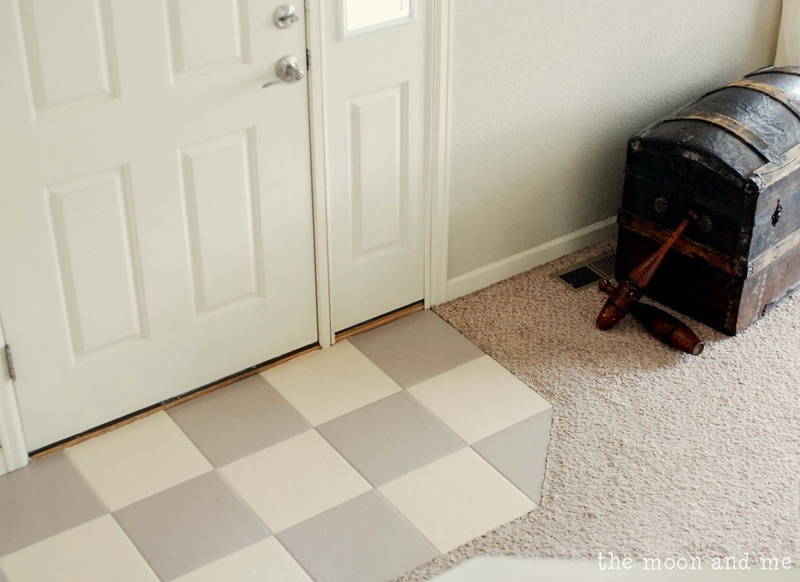 The tile looks great, the color combo looks amazing in your entry. I can never tell you how much I appreciate this post and all your hard word. Plus the fact that you honestly shared the good and bad details.. I had serious plans to paint my kitchen floor starting this coming monday..
so thank you a million times.. 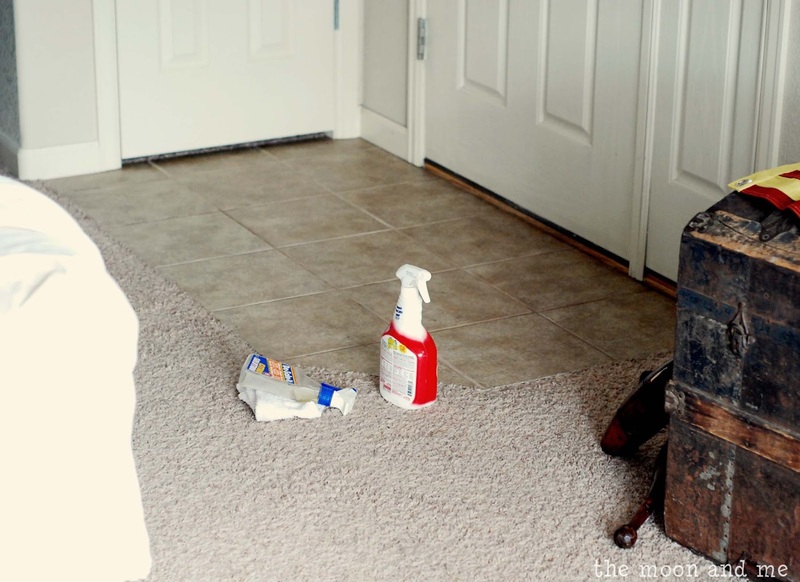 Your floor looks great! Love the colors you chose! Your floor really looks great, I will have to remember this! I have pinned it! 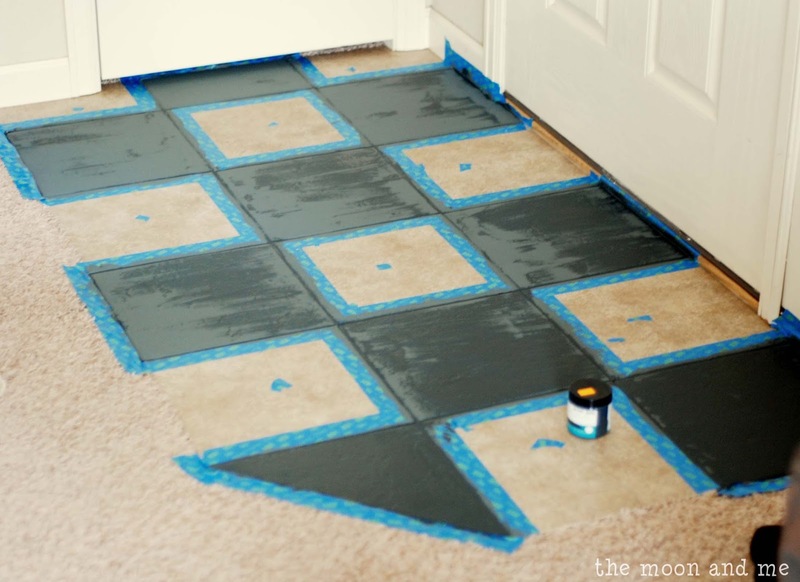 Looks great and you are brave to paint your tiles! My hubby would have had a fit. Thank you for joining THT! I second Pamela above! You are brave (this is totally something I would have thought of but I probably would have had to re-do it like ten times and then at the end it would have been so screwed up we would have had to buy new tile-ha!) It looks great! I think you have done almost everything. I am very sure descriptive information will be useful for visitors and business seeking people for best flooring tiles solutions. The final look is very appealing, Thanks for sharing the whole procedure of tiling installation. It is very helpful for your worthy blog readers. You did a great job! I want to carry this over to mytile flooring in Phoenix. It's beautiful! That looks great. I might try something like this for my tile in Calgary. Thanks for sharing! This looks amazing, and completely changed the look of the corner. Congratulations. Thanks so much for sharing this great information! I have been really interested in finding out more about Ottawa ceramic tile... Where should I go for that? I am looking for a good deal on ceramic tile in Hamilton. Does anyone know of store that has a good deal on the? Northern Resin Flooring Ltd have just complete installing a Polyurethane screed at Iceland in Sheffield. Polyurethane screed is ideal food preparation, chemical attack and food manufacturing zones. I like this tile look! I am glad it turned out! I really want to do the same thing after I get new tile flooring here. Maybe I can find some that looks like that. Hey there. 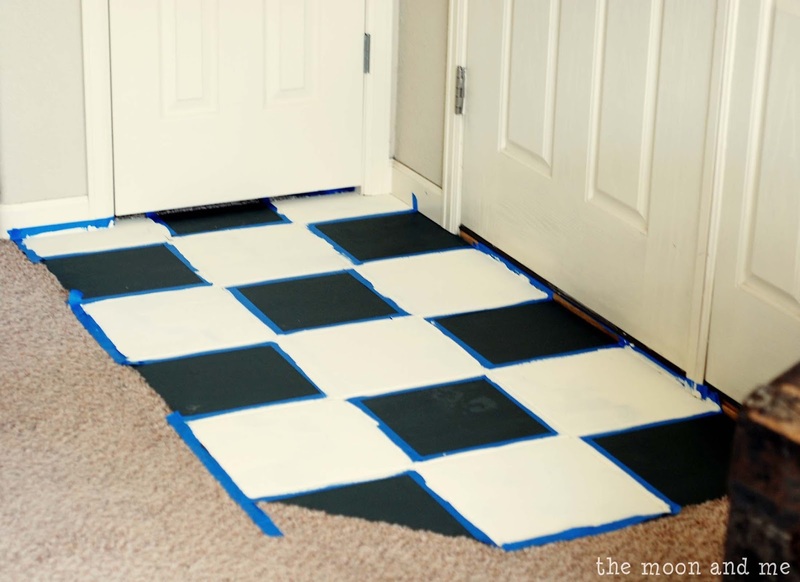 My husband has been wanting new tile flooring in our bathroom and I am thinking about getting it done while he is out of town so he wont have to worry about it. Do you happen to have any recommendations on a company that lays tile in Calgary? Please let me know, thanks. Wow that looks amazing. Sometimes the projects that aggravate us turn out the best cause we look for a solution. I have this boring tile throughout my new home. The builder didn't offer anything nice and upgrades were ridiculously priced. Some I'm trying to figure out a way to make it pretty, even just white would be an improvement in my mind. Did you prime this in anyway before you painted? Did you sand the tiles to rough up the surface? I have a whole box of extra tile I can mess around with. I'm sitting here thinking what would happen if you spray painted it. Just me and my 2 cats so not much traffic or dirt anywhere and live in a warm climate. Any way thanks for sharing and Happy New Year. I used chalk paint, so I did NOT prime or sand. But I think I would the next time. It looks great! Love the soft look. Definitely paint the wood between the door and the floor! I would paint it the off white...or paint two sheets of poster board with each color and see which looks better. It looks beautiful! I had never thought of painting tiles. Thanks for the idea! Looks great. I found your site because I was looking for people who have painted tiles. Our builder used tiles on our kitchen backsplash and I hate the color. Question for you: did you paint the grout? I did paint the grout...because I wanted the checkerboard look and didn't want the grout a different color. The page is really very nice. The colors used are really very beautiful and looks bright. 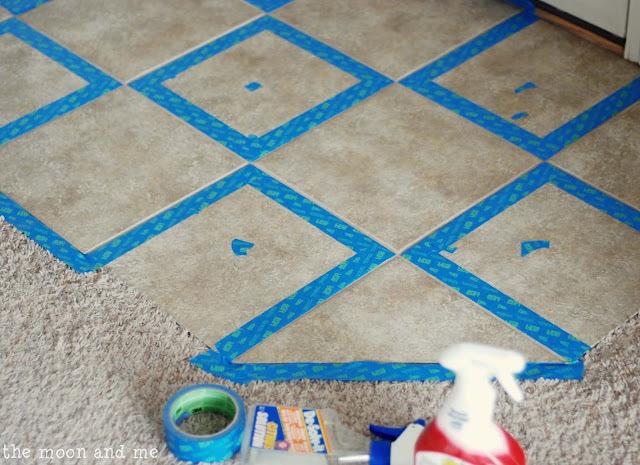 The tape used for the floor looks nice. The rooms look rich when we use this type of paints. Wow, the tiles look fantastic. I'll admit, that is one thing tiles have over hardwood flooring . I like the look, subtle but very appealing and done well. Congrats. Hello Kelly, very good job ! 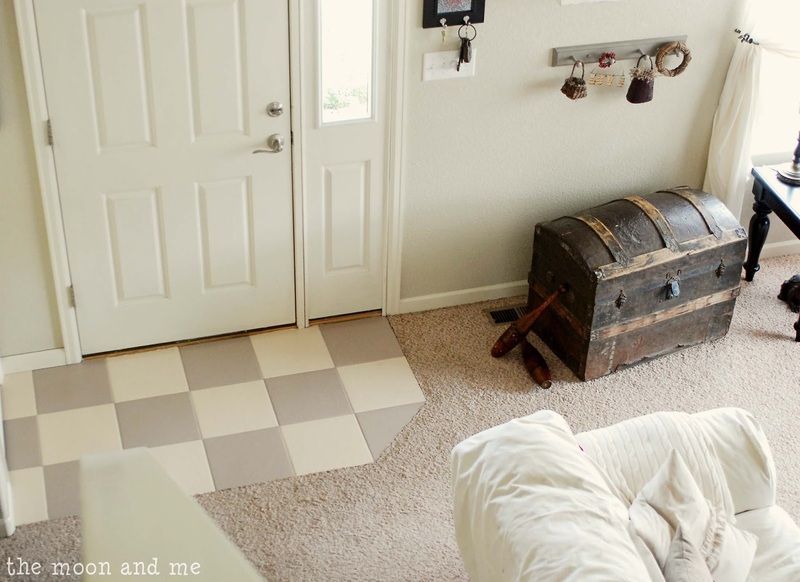 I would like to paint my floor with chalk paint too but can you tell me if the paint well resist. Sorry for my english because I write to you from France ! How is the paint job holding up? I'm considering painting the outdated floor tiles in my powder room and it gets only slightly less traffic than an entry way, so I'm curious. I have to say it's held up quite well! That is until I drug a piece of heavy furniture across it with a metal bottom. :( Now I have a touch up to do. But otherwise, I've been really pleased! Hello Kelly, Love what you did with the tiles, it's beautiful!! 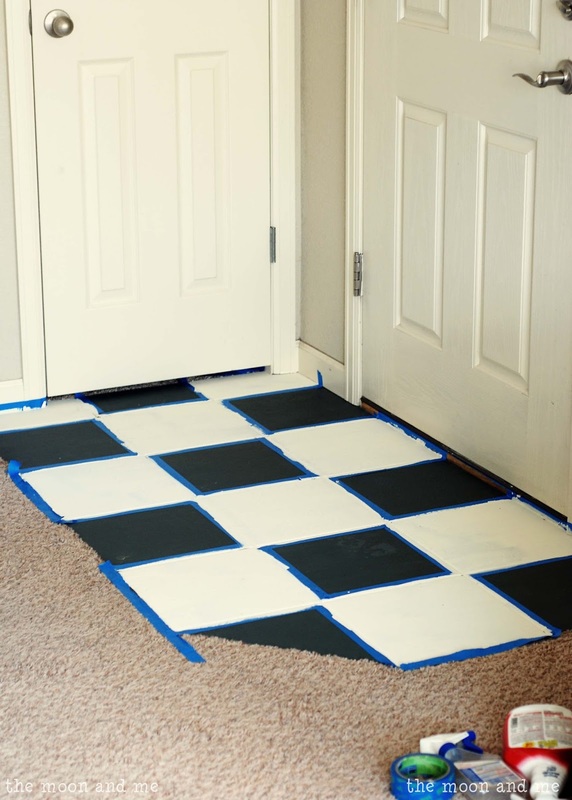 If you haven't painted the board beneath your door yet, white would be lovely. Kelly, do you think I could do this with vinyl flooring? Love your site. Thank you for your time and consideration Kelly. Oh wow!! I can't believe how much more I like the painted tile! I've been wanted to spruce up my house this summer with some new colors and furniture. I've always like the tile that we have in our entry way, kitchen, and bathrooms, but I think that this would add so much more life to the house. It would be so much fun to do different colors for each room, corresponding with all the other colors that I'm planning on putting in them. So far, I've decided that I want a red, white and yellow theme for the kitchen. I think that the red will give it a beautiful kick, and the yellow will make everything seem so bright and cheery. This actually looks really good considering how you set it all up. I wouldn't mind putting some tile by my front door as well. I think it would help keep my carpet clean. Thanks for sharing this site, it is very informative for the business Products. Keep on continuing with this. I also provides this service visit the site.Best Western drapery Curve Hospitality provides hotel owners and hotel franchises with comprehensive solutions to maximize operational efficiency. Wow you did an incredible job with painting your tiles! I will have to try it out in my home this fall. I am going to test it out in the basement bathroom though just to make sure that I have it down. Looks great. I was wondering, would this work for an old ugly vinyl floor? I have a bathroom floor that is hideous and I cover it with rugs (lots of rugs). 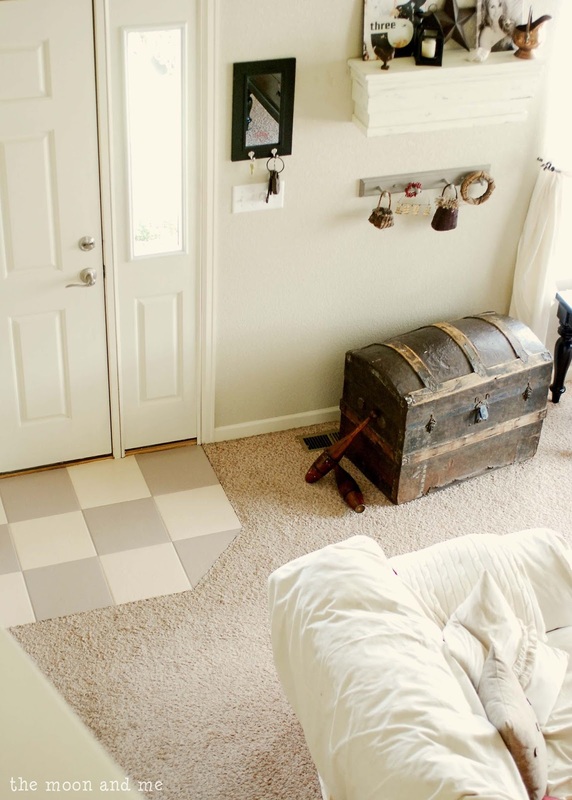 I would like to have just one rug because it looks like I'm trying to hide the floor with multiple rugs. Hi! That looks really great. Question though....when you are saying chalk paint, are you talking about the paint that you use to make your own chalkboards? I live in Mexico and the paint options are so limited here that I want to know exactly what I am looking for when I go into the paint store. Thanks! I had no idea you could even paint floor tiles. I really like the grey and white together. I want to do this to my entry way. I feel like it just really adds to the room. I'm actually really surprised with how well your tiles came out after painting them. I probably would have just gone and bought different colored tiles and put them in. I don't think I would have trusted myself to paint tiles, especially that close to carpet. In any case, I think it looks fantastic! Wow such delicacy but it would have been more great if you have consulted us before, you can now. When I was a kid, my dad put a tile floor into our entry way. It looked so fun and like a giant puzzle when I was a kid. I recently got done putting in my own tile floor at my house. While, it wasn't impossible, it was not as easy as a children's puzzle. If I could find a tile dealer in my area that I could purchase things from, that would be great. 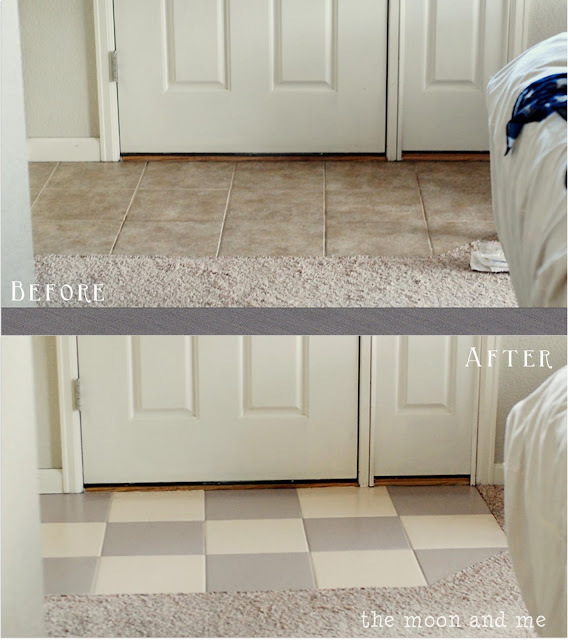 I would really like to do that and that way I could get the floors in my home done and have them looking great. That is something that would help me out greatly and would help with my stress on the subject in general. Wow, the before and after pictures are astounding with how much classier they look! We have some tiles the run into our hardwood floors. Maybe we could get a similar color to the dark brown wood for our tiles to match better. What would you suggest? Looks fab!!! One question tho; You mentioned you mixed up your own chalk paint. How did you do that? Thanks for sharing! You did an awesome job!! I have painted grout lines before but I have never thought to pain tiles. Would it be possible to paint ceramic tiles like the ones around the shower or bathtub? ......the little high gloss square tiles? I don't know how those would hold up since they would be getting wet so often. A backsplash would probably be ok, though. painters woodbridge vaThank you so much for such a great blog. for free. Thank you for sharing. Article of this blog are good. This is an amazing tutorial ... I loved the final product!! Very nice colors! Thanks for doing all the trial and errors for us! 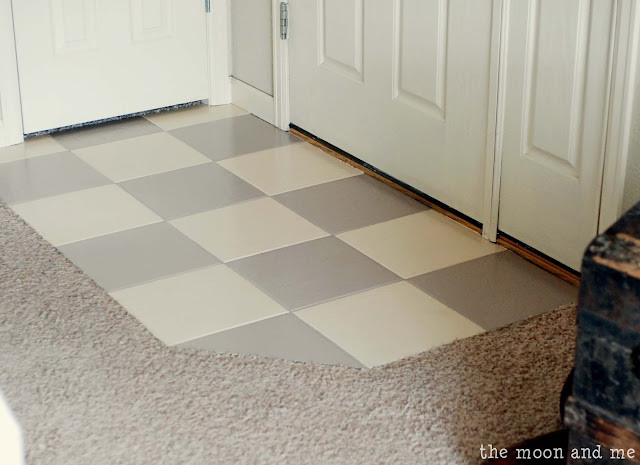 hehe i think i might just have to try it on my linoleum floors. 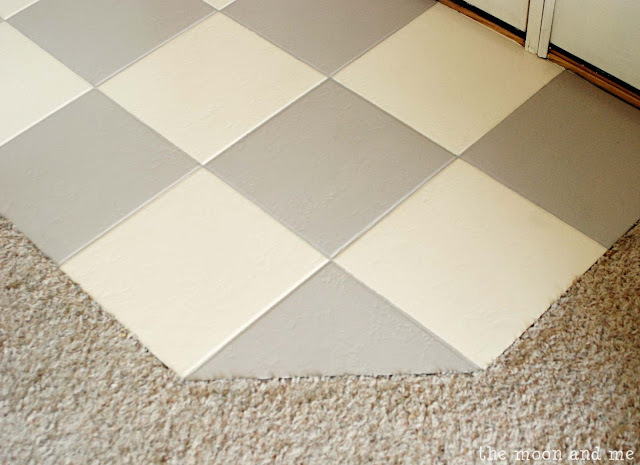 The linoleum floor is made to look like rectangle stone blocks. it is nice but i am sorta tired of the look.